The backyard can host a wide range of equipment from grills to swimming pools. In small yards, there is room for an outdoor swing set, but the amount of space is limited. Instead of skipping the idea and thinking that a swing set won’t work in a small space, make accommodations. The best swing sets for small yards are found in the homes of people who did their research. Make the effort to select the right playground equipment for your small yard. Each seat has a weight limit of 100 lbs. Supports a maximum weight of 400 lbs. My First Metal Swing Set by Sportspower is a small yet sturdy swing set that fits well in any small backyard, whether you own an apartment, townhouse or single family home. It’s recommended for kids between 3 and 8 years old who want a small, private space to themselves. 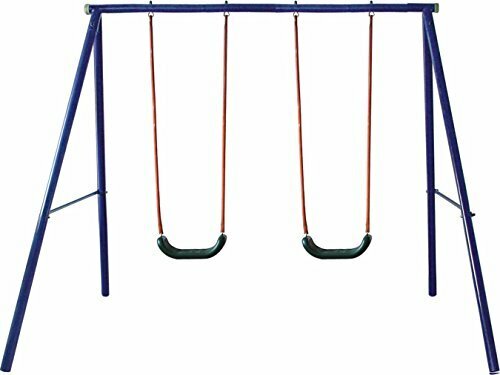 Even if your yard is covered with a patio deck or overrun by a garden, this swing set will fit into any corner or empty space that measures only 89 inches in length. There should be a few extra feet of space so that the kids have enough room to swing freely. The metal framework and foam-padded legs ensure that the swing set does not break down easily. The maximum weight limit is 100 pounds per swing seat, and the total limit is 400 pounds. At 7 feet long, it is one of the smallest swing sets available that still supports an average child’s weight. An average of 4 children are encouraged to use the set at one time. As long as kids and parents follow the recommendations, they will continue to use this swing set for years without any problems. Smooth and Durable Design: Effortless swing brackets with two-way steel end supports. The Movement God Metal Swing Set fits into any small to large backyard with 10 or more feet of space. Whether you have a small patch of grass near a garden or behind the pool, there’s a place to fit this swing set. Each swing holds a maximum of 100 pounds of a child’s weight, so adults are not able to use the set. The swings are specially made for children 8 years or younger and their companions to enjoy for hours. The steel structure is damage resistant and lasts for years through any kind of weather. A two-year warranty is included to provide additional peace of mind to the buyer. Some people think that the basic design is a turn off. Few swing sets are very detailed and intricately designed. If kids want other forms of play, parents can always buy other types of equipment separately. Ideally, a swing set should be simple for kids who love to swing more than anything else. Most kids go straight for the swings on the playground, and at some elementary schools, the swings get filled up first before the monkey bars or merry-go-round do. Overall, this is a good starter set for those who do not want a more elaborate and more expensive play set. Like every other swing set, there are two swings attached. In addition to the regular swings, there is a Fun Glider that accommodates two riders who either sit down or stand up as they ride. Having the glider is especially helpful when two kids are already using the swings. In addition, there is a large disc swing that seats one child at a time. Last, find a wavy slide on the side. The weight is 100 pounds for each user of the play equipment. Adults should not use the set and neither should multiple children who want to pile on top of it at the same time. This swing set remains strong and undamaged as long as it’s not misused. The swing set has steel frames and foamed legs for additional safety and comfort. The blow molded material is made of polyethylene plastic that does not crack, bend or break under the weather. It meets recommended safety standards that are set by the American Society for Testing and Materials (ASTM) and Consumer Product Safety Improvement Act (CPSIA). The Camo Commander Swing Set makes a good first impression by looking stylish, safe and resilient. Six kids can play at the same time without it feeling too crowded. The swing set is also easy to assemble despite its elaborate design. There are 4 stations to enjoy on the Fun Time Swing Set. Find a small wavy slide along with two swings that hold 105 pounds per child. Also attached is a trapeze bar for kids to try acrobatics and a seesaw that is provided separately. The recommended ages are 3 to 12 years old. The main benefits are the two swing seats that promote hours of fun swinging. Even preteen kids like to swing and will enjoy using this swing set. Younger kids with shorter legs will enjoy trying to reach high heights on their own. For toddlers, parents can attach baby swing seats with leg openings. This swing set is small and designed with safety in mind first. The swings do not swing out too far or cover a long distance, so children always remain safe and parents never worry about dangers. The swing chains are covered in vinyl and adjustable to change the height. The Fun Time Swing Set is starter equipment for growing kids and parents on a budget until they can make a bigger upgrade. The set also increases the property value if it’s left in the yard while the home is being sold. It’s ideal for elementary school kids who do not have massive backyards but still want their own private playgrounds to enjoy. The simple design of only two swings and one trapeze bar is designed for kids who mostly love swinging. Three kids can use two types of equipment at one time. The trapeze bar has a horizontal bar and two rings attached to chains that allow kids to swing back and forth. The equipment can be adjusted at different heights above ground to suit different body sizes. The swings of the Swing-N-Slide Orbiter hold 115 pounds each and are designed for children up to 11 years old. The entire set takes up a small amount of space in the yard, but it’s not so small that kids feel crowded or knock into each other as they swing. The Orbiter is not another complex playground because it is guaranteed to be safe. The set has been manufactured and tested to meet ASTM standards for playground safety. The A-frame construction is sturdy and easy to assemble in a few hours. The wooden guard posts will not rust or decay for as long as the set is left outdoors. No maintenance is required because the wood is sealed, so no cracks or splinters appear. The posts are said to be stronger and longer lasting than steel poles that are typically used in play sets. It takes some preparation to design a small space in your home. When you want a backyard swing set, it’s more difficult because you want it to be fun, but everyone assumes that bigger play sets are better. You have to think about downsizing the equipment that you want or using less equipment that fits into the space. If making your yard bigger is not an option, you need to make accommodations for this small area. First, determine the maximum amount of space available for your swing set. Draw straight lines using chalk or tape to make measuring easier. Include the farthest point that a person can swing without having his or her feet hit another person or object. Test the swing and see how close it stops from an obstacle. Then, have someone test the swing and swing out with the legs fully outstretched. Consider the average height of the children who will use your swing set and the average length of their legs. It’s not ideal for the swing to stop just two feet from a patio table because the legs can still hit the table. Consider adding a few extra feet to allow people to walk around the patio table freely. Allow at least six feet of empty space from the swing seat to the nearest object, whether it’s a wall, door or patio set. Once you know the maximum amount of space allowed, measure its length, width and height. The length is the most important measurement that determines the maximum length of the swing. Height also affects how far the swing can go. Next, use the measurements of your yard to figure out how big the swing set should be. If the maximum length and width available are ten feet and six feet, you can choose a swing set that is ten feet long and six feet wide. Review the dimensions that are listed in the product description, and do not choose any set that exceeds these measurements. Consider the height of the swing set because this affects how far the swing can go. The higher the height is, the farther the person can swing and the more enjoyable it is. Review the weight because some small sets break down easily. Know the maximum amount of body weight that is allowed on each swing. If the weight is only 100 pounds per child, you risk breaking the swing seat if you allow adults to use it. Some swing sets are designed for certain ages and weights. There are baby swings that swing out only one or two feet. Then, there are swing sets found on elementary school playgrounds that are made for kids from ages 6 to 11. Older kids with long legs will not enjoy swinging on sets that swing out only a couple of feet. They can also break the seats if they’re not careful. Likewise, younger kids will not be safe or feel comfortable on oversized swings that their legs are not strong enough to handle. Choose from different styles of swing sets that vary in size and design. There are basic sets that consist of metal poles with one or two swings attached. More advanced sets have two to four swings with a slide, playhouse, ladder, sandbox or other features attached. Some parents find it more reasonable to buy an all-in-one play set that is the same size, but more expensive, than a basic swing set that has one or two swings. Decide if you have enough room for an elaborate play set or need to add a few additional feet of space. It’s each individual’s preference to choose the right type of swing set to buy. What Are the Biggest Complaints About Swing Sets? Many buyers want to know the biggest complaints about swing sets and playground equipment. Safety is the biggest concern, but it’s not a common complaint because most companies follow basic safety standards. Injuries are minimal, and if they exist, the manufacturer is rarely at fault. Not being able to install or set up a swing set is not a common problem either. Most companies provide step-by-step instructional manuals to help anyone assemble a play set in a few hours. Some parts are assembled beforehand, while others require only snapping and locking them into place. Most buyers don’t need technicians to help them put the equipment together. Instead, a major complaint is play equipment that breaks down after a few years. That is why warranties are often included in the purchase of play sets. These breakdowns are caused by either poor manufacturing or the misuse of equipment. There are ways to avoid buying unreliable play equipment. The first step is to review the types of materials that were used to build your play set. Most companies devote two or three sentences to mentioning the materials used, such as steel, plastic or fortified wood, and the benefits of each one. Start by knowing the basics of how the equipment was built without knowing every detail. It’s common to have problems that are directly linked to the misuse of the play set. In this case, the owners of the play sets are on their own and are not covered under the warranty. Misuse occurs when someone unknowingly damages a swing set. An example is when an adult uses a swing that is designed to hold a child’s weight and breaks it. If the company specifies a weight limit, anyone who uses the swing is expected to know this limit and is held responsible for exceeding it. Abuse is different from misuse. Someone abuses the swing set by knowingly causing damage, such as jumping on the seats, kicking the frames or pulling too hard on the chains. This is seen only in children who are too reckless and aggressive in their behaviors. It’s the buyer’s responsibility to prevent both misuse and abuse by restricting and monitoring the type of people who use the swing set. Children and adults should be informed about how to use the equipment properly. What Are the Biggest Highlights of Swing Sets? For many complaints, there are just as many compliments from people who come across good swing sets. The biggest complaint has to do with the ease and enjoyment of the swing. First, the swing should support the full weight of the child or adult who sits on it. On a weak swing, the chain can break apart suddenly or become detached after only a few years. Another good quality of a swing set is its height. The higher the swing is, the farther the person swings. However, to fit in a small yard, the height of the swing set should not exceed a few feet. The appearance of the swing set matters, too. Most consumers buy products based on how good they look. The appearance is the first quality that people see in another person or object. Kids tend to be more superficial than adults and prefer swing sets that are colorful and physically attractive. Many kids like swings that support two or more passengers. They enjoy swinging with a friend instead of by themselves. They enjoy using two-seated gliders and disc swings that are different from traditional one-seated belt swings. Sportspower LTD sells a wide range of swing sets along with trampolines, bounce houses and water slides. Since 1992, they have made quality hardware and inflatable equipment for children’s outdoor playgrounds. They were one of the first sellers of water slides and sell to major retailers around the world. Movement God provides a variety of play and swing sets along with basketball hoops and backboards. Their swing sets are constructed in simple designs that are durable, easy to assemble and adjust to the user’s needs. XDP Recreation have provided outdoor play equipment for more than 30 years. There are playground swing sets and indoor exercise equipment made with safe touch parts and strong steel frames. Flexible Flyer has more than 100 years of experience in selling metal swing sets and accessories. Since 1889, they have accumulated the largest supply of these swing sets in the U.S.
Swing-N-Slide has provided swing sets, slides, playground sets and accessories that meet safety standards set by the ASTM. For more than 30 years since their start in 1985, they have become one of the leading manufacturers of do-it-yourself outdoor playground equipment. They specialize in making twisting tube slides along with slides, playhouses and rock climbing walls. How important is safety in a small yard? Safety is the most important concern to think about as you design a small yard. It’s easier for people and things to run into each other and create accidents. When children are playing the yard, the risks are very high because most kids are reckless and have a minimal sense of danger. When buying a swing set, provide enough space for kids to swing without getting too close to a wall or door. Consider the people who will be walking around the yard as the kids are swinging. They should not have to risk getting hit by the swing or dunk and run across the yard to avoid a swing. What are other factors to consider besides safety? Next, think about privacy. Swings tend to go over the fence, allowing your children to look into the neighbors’ yards. The neighbors can see what your kids are doing, too, so keep some privacy in the yard. Also, consider how comfortable everyone will be around a swing set. Swings work well in all kinds of yards, even the busiest ones that have swimming pools or animals walking around constantly. Owning one becomes a problem when there is not enough space to move around freely. Kids must have enough space to swing without disturbing others in the yard. What are the additional features on a swing set? Not all swing sets are made alike. The most basic styles consist of metal poles with one or two belt swing seats attached. The most elaborate styles have swings along with slides, ladders, trapeze bars and clubhouses. Other features are sliding poles, seesaws, monkey bars and roof canopies. As a consumer, review all of your options when it comes to buying the right swing set. Should I go by official safety standards? A lot of buyers go by official safety standards that are set by organizations like the FDA. Similarly, the American Society for Testing and Materials (ASTM) sets standards for playground sets that are sold all over the world. Going by ASTM standards is encouraged but optional. It’s just as effective to review the product description carefully and use your best judgement to buy safe products. Heavier swing sets are usually more dangerous than lighter ones, and the type of material also affects the safety. Should I test the swing set first? Testing a swing set is not necessary before buying it. Ideally, you would test the swing to check the levels of comfort, safety and enjoyment. With online shopping, it’s not possible or necessary with the help of customer reviews. You rely on the opinions of people who actually bought the product. The more reviews the product has, the more information you have about its efficiency. Knowing that a swing set has 100 good reviews is just as helpful as testing out the swing yourself. Even having 10 reviews on hand is enough to help you make a good decision. 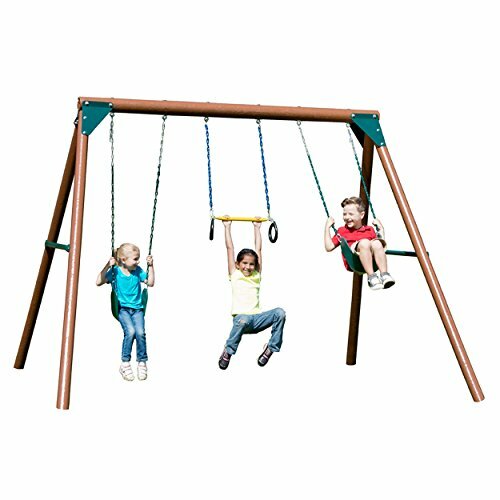 The Flexible Flyer Fun Time Metal Swing Set is the top pick among all of the best swing sets for small yards. The two-swing set is suitable for small yards with minimal space. The trapeze bar and slide add two nice touches to a fairly simple design. If you want a swing set without the elaboration, the Orbiter is the ideal choice. The steel and plastic framework is sturdy so that the swing set is usable for decades without maintenance. 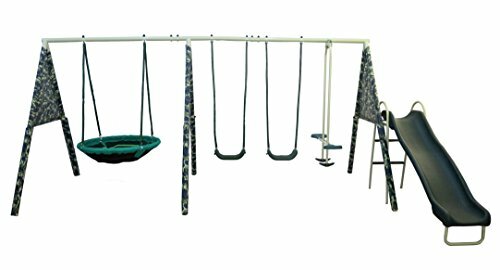 The second pick is the XDP Recreation Camo Commander Swing Set for kids who want a more versatile swing set. The main problem is its length at 15 feet, which makes it too big for many small yards. The benefits are the 5 different play stations that are provided along with the standard two swings. 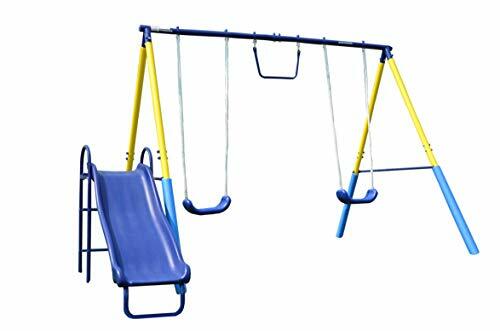 The Swing-N-Slide Orbiter Swing Set is another good choice similar to the Fun Time Set, and similar in the look and function, but its top-grade construction design does not make it affordable for everyone. Some swing sets are good on design but too expensive to afford. Others are affordable but have limits in the design and longevity. 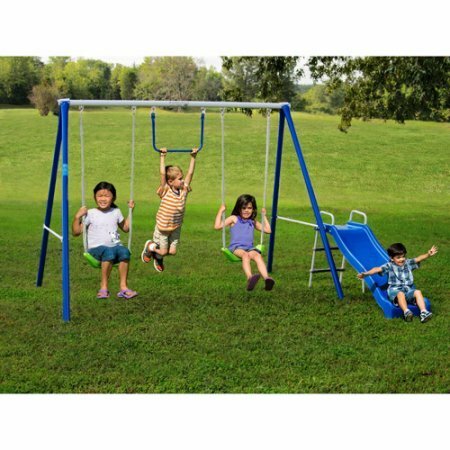 For a simple, affordable and high-quality swing set that fits any small yard, consider the Flexible Flyer Fun Time Metal Swing Set. Find other activities you can do in your yard here.